The dive site Good Hope Reef is an offshore rocky reef in the Smitswinkel Bay area on the Cape Peninsula, near Cape Town in the Western Cape province of South Africa. This is a small granite reef on a sandy bottom with lots of gorgonian sea fans. 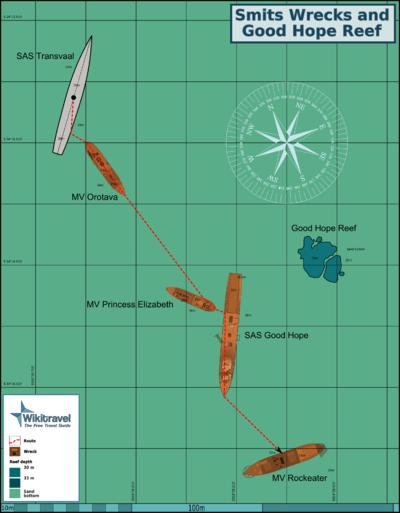 The name "Good Hope Reef" is derived from the nearby wreck of SAS Good Hope. Maximum depth is about 35m on the sand. and the top of the reef is about 30m. The reef is a small area of granite corestone outcrops, about 33m in diameter, comprising two main outcrops, both about 5m high at most, and a few smaller boulders or outcrops on the perimeter. The reef area is split by a sand bottomed gully running roughly NE to SW.
Geology: Pre-Cambrian granite of the Peninsula pluton, surrounded by fine quartz sand. This is a boat dive, as it is too far from the coast to swim. The reef will usually be quite dark due to the depth, and photography will mostly rely on artificial lighting. There are plenty of subjects for macro and close-up wide angle shots. The site is small and the whole reef may be comprehensively visited on a single dive. The sea fans are almost all on the steep side slopes of the reef, and a circuit of the perimeter will take you past these. If you have time left, take a look over the top of the reef. There are no known site-specific hazards. No special skills are required, but it is useful to be able to deploy a DSMB in case you surface away from the shot line. Certification appropriate to the depth will be expected. Nitrox is recommended to extend no-stop time. A light may be useful to display the true colours of the reef life. This page was last edited on 20 May 2011, at 10:20.